Balance your mirrorless camera weighing up to 5.5 pounds on the RAGE GEN 2 3-Axis Motorized Gimbal Stabilizer from EVO Gimbals for stable shots akin to those coming from stabilization systems costing many times more. Using a 32-bit Coremark chipset, the RAGE GEN 2 can quickly react to motion and compensate on all three axes with full 360° motor rotation. Another advantage to the full 360° rotation is the ability to operate in inverted and other alternate orientations without encountering rotation limits. The direction of the gimbal can be controlled using the joystick on the handle or with the free mobile app. Connect a separately available control cable to let the gimbal start and stop your camera. Included are two rechargeable batteries, a charger, a lens support, and a storage case to protect the equipment as well as keep the components organized. Box Dimensions (LxWxH) 14.0 x 12.2 x 4.1"
RAGE GEN 2 3-Axis Motorized Gimbal Stabilizer is rated 1.0 out of 5 by 1. Rated 1 out of 5 by Booker from Not Worth It I purchased this gimbal close to a year ago and my experience has not been the best with this gimbal. It can stabilize footage but doesn’t do a great job and produces sudden wobbles/jumps in the footage even after following all instructions and properly balancing. 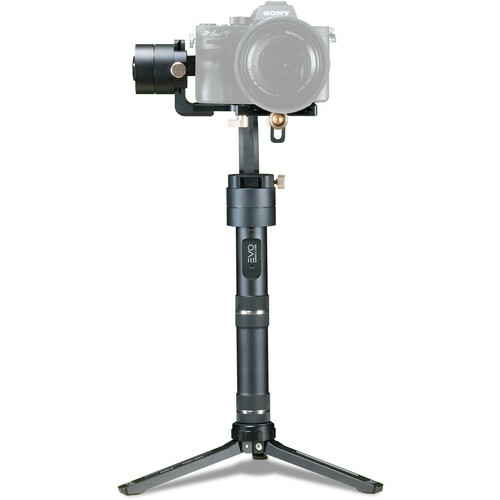 The gimbal is cheaply made and I honestly regret investing my money into this gimbal.I also purchased gimbal arms from this company and they are also a cheaply made product that doesn’t properly tighten around the gimbal. I highly recommend the zhiyun crane 2 or moza air 1 and 2 if you are in the market for a new gimbal. Please do not waste your money on this product or company. Is this the Gen 2? The package it comes in is 6.25 lb. So take off 1/2 to 1 lbs. Is this a US manufactured product? I'm not sure where it is manufactured, but Evo is located in Oregon. If you call their support line you'll get someone from the US. Answered by: Justin M. B.